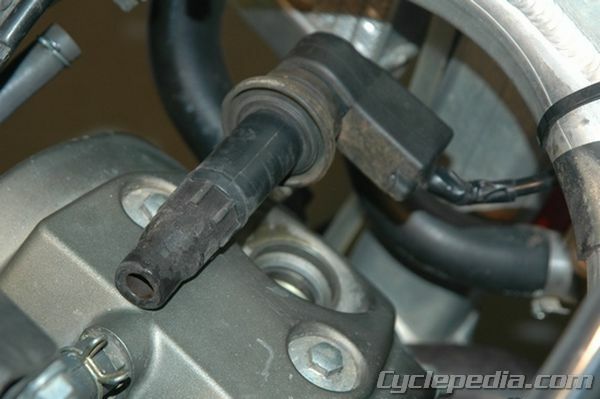 Some motorcycles use what is commonly called a stick type ignition coil that fits directly onto the spark plug. Use compressed air to blow out any dirt or debris that could fall into the combustion chamber when the spark plug is removed. This is very important to prevent engine damage. 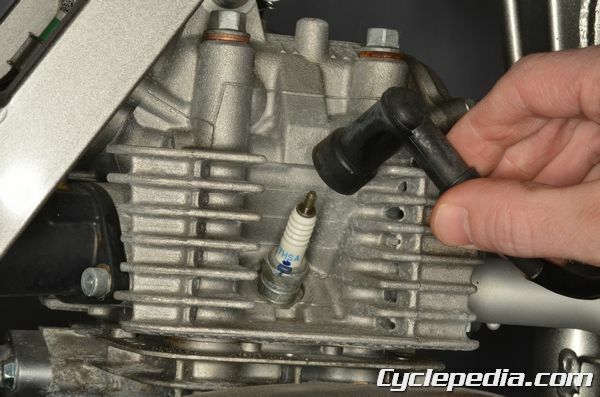 The factory spark plug wrench is usually the best option but if it is not available use a spark plug socket and ratchet to remove the spark plug from the cylinder head, you may need to use an extension as well. Spark plug sockets differ from ordinary deep well sockets in that they have a rubber insert to hold the spark plug in the socket for easier removal and installation. Inspect the spark plug porcelain for cracks or damage. Check the electrode for wear, fouling or deposits. The center and ground electrodes should have nice square edges. If they appear rounded, replace the spark plug. The spark plug porcelain insulator nose should be a light tan color, which can indicate how your engine is performing. For example, if the spark plug nose is white the engine may be running too lean, if the spark plug nose is dark the machine may be running too rich. Use a flat feeler gauge or a wire gauge to measure the gap between the ground electrode and center electrode. To change the gap, carefully bend the ground electrode. 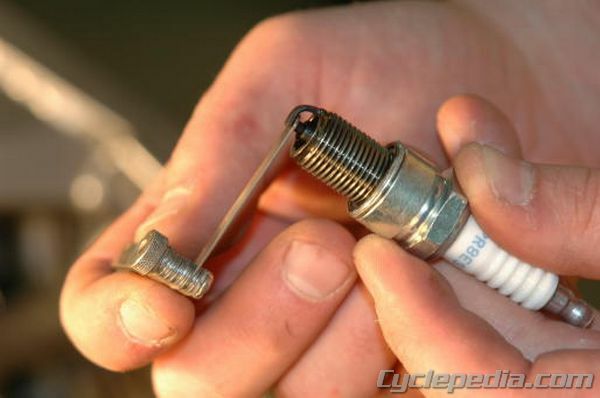 Install the spark plug by hand and give it a few turns. If the spark plug hole is recessed farther than you can reach by hand you can use a piece of tubing to safely install the plug. 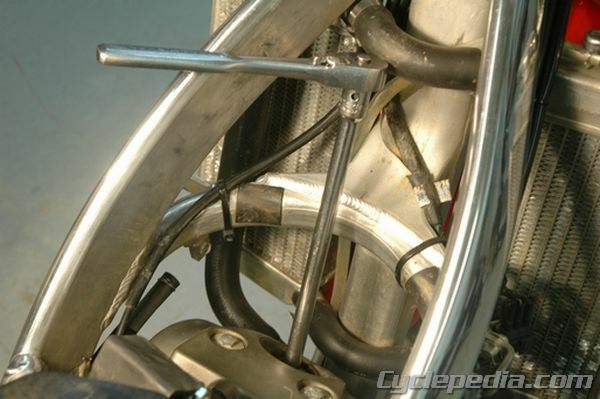 To do this you take a length of fuel line or similar hose and push it over the top of the spark plug about an inch. Now take the tube with a spark plug on the end and lower the plug into place and thread it in by spinning the tube with your hand. 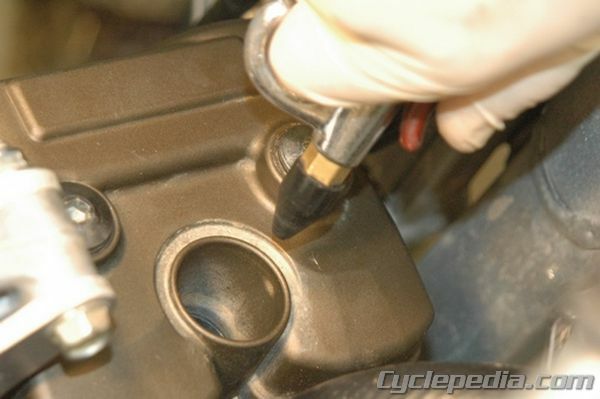 Once the spark plug is installed, finish tightening it with a torque wrench. Be sure to check your service manual for the proper torque specification. 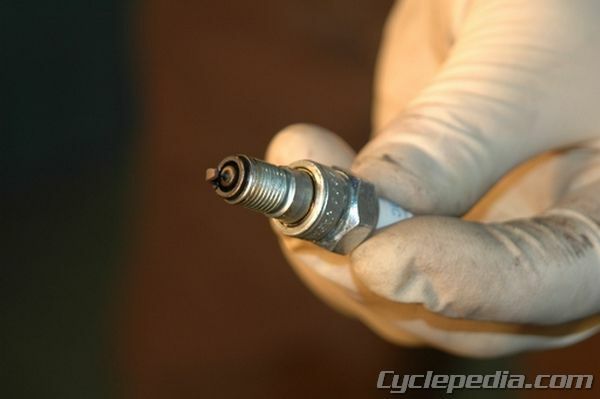 It is unfortunately very common (and damaging) for people to over-tighten spark plugs. Remember that the threads in the cylinder head are soft aluminum and can easily strip. A properly adjusted torque wrench will help you install your spark plugs correctly without damaging the cylinder head.